People like to rag on downloadable content. It's a boondoggle, detractors say. A crass way to get extra cash for a chunk of a game that should've just been included on the disk. That's true in many cases. But Assassin's Creed IV: Freedom Cry is the better brand of add-on, one where developers' experimentation with the tools they've already made results in a different take on a formula that already exists. Out today, the new chapter of ACIV focuses on Adewale, Edward Kenway's first mate in the main story of the game. Freedom Cry happens several years after the end of ACIV and Adewale is now an Assassin in charge of his own ship. You'll get more of the naval combat that's become the crown jewel in the most recent Assassin's Creed games. Freedom Cry opens up with a tense battle against bigger, more numerous ships, eventually putting you on land where you'll get to use new weapons unique to Adewale. Once on land, the former slave gets a machete and blunderbuss (pretty much a shotgun) as part of his special set of instruments. Both weapons feel more blunt than the cutlasses or pistols that Edward uses. On the stealth side, he can use firecrackers as a distraction to lure enemies to or from him. 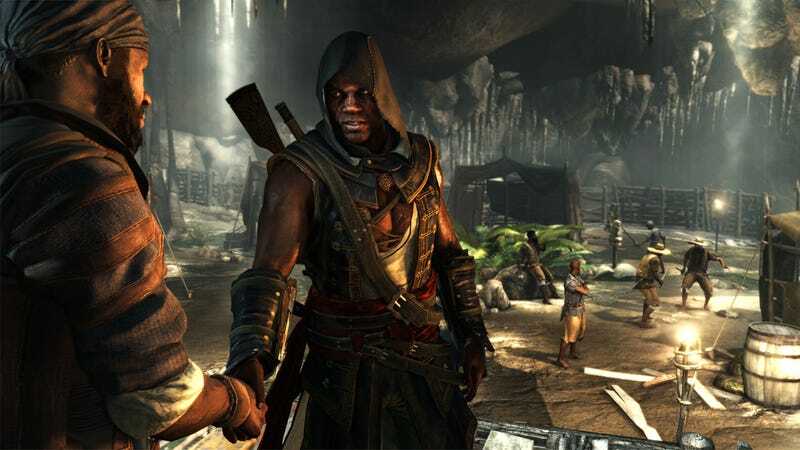 A sidekick in the main storyline of Assassin's Creed IV, Adewale commands the center stage here. Though the trappings are the same—colonial Caribbean open-world environs, sidequests that open up rewards and resources and a mix of stealth, ranged and close-quarters combat—the directives are very different. You're trying to foment a rebellion, so instead of helping pirates fight imperial soldiers, you're liberating slaves to become recruits. The plantation locations represent a trickier challenge for players. Failure to maintain stealth while raiding a plantation means that overseers start killing slaves, meaning you get less manpower for your overaching mission. It's a harsh penalty for not sticking to a core gameplay tenet but one that works both thematically and inside the game. Slave ships represent a similar tweak. While you can engage such vessels and their escorts in combat as you would other seacraft, sinking a crippled slave ship means its human cargo never joins Adewale's cause. If you finished the main campaign of ACIV, you may find yourself having to fight certain reflexes while playing this DLC chapter. That shift feels like a clever thing here. Freedom Cry, which costs $10, is supposed to offer anywhere from 90 minutes to three hours of new gameplay, which will vary depending on how fully you decide to play through it. But, given how different it feels from Edward's adventure, Freedom Cry justifies its existence. Yes, you'll have to pay extra but the experience of playing as Adewale is worth it.